Quite possibly the most delicious thing to ever be eaten from a bowl! 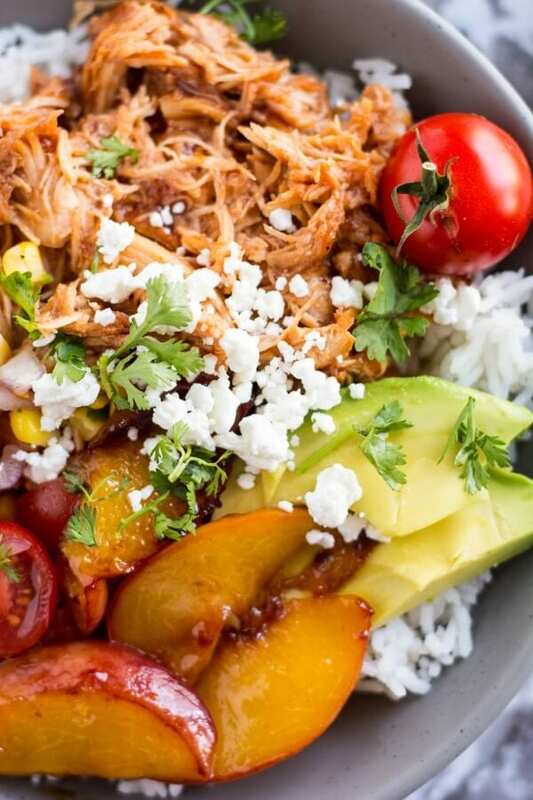 It’s amazing how a simple slow cooker chicken recipe can so easily turn into this. 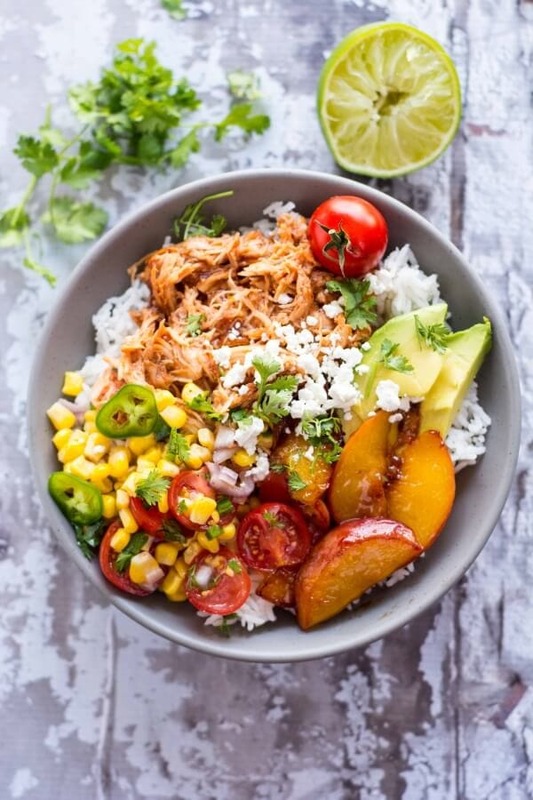 Juicy flavorful chicken, sweet caramelized peaches, crispy corn salsa with fresh tomatoes and zesty jalapeños. Top it all off with some creamy, salty goat cheese and that, my friends, is just the perfect meal to dive into. 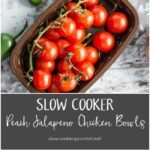 You know those people who think using their slow cookers to make fresh, delicious dinners isn’t possible? Let’s round them up and send them the way of this simple, fresh and delicious recipe! You might be thinking with all that these bowls have going on that they are just too complicated, so let me show just how easy it can be. First off, for the base of my bowls I used a white basmati rice. I have a rice cooker with a timer so it was really no extra work for me to set it up and program it to be done at dinner time. If you don’t have one and need something quick, just use a minute rice or a microwavable rice packet. 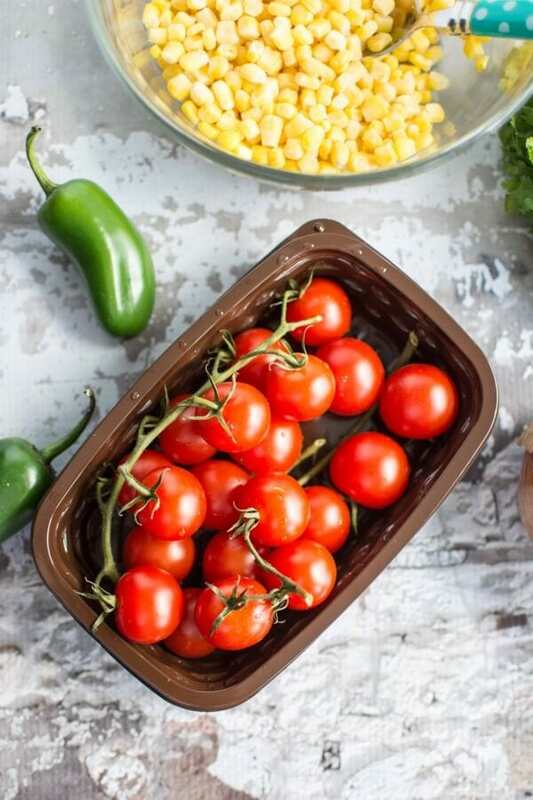 For the salsa and sour cream, which each have a few ingredients and may require just a bit of chopping, make them the night before when you have a few extra minutes. Frozen then thawed corn kernels will make quick work of the salsa and for days when I’m really super pressed for time I always keep bottles of the freeze dried cilantro on hand that you get in the produce section at the store. Throw the chicken in the slow cooker in the morning with the BBQ sauce and preserves since it will only take about 3 minutes. When it’s time to eat all thats left is to caramelize your peaches! Have you caramelized fruit before? It’s much easier than it seems! Basically sautéing some sliced fresh peaches in butter and sugar for a few minutes and you have an amazing treat! So worth it! So give it a try!! 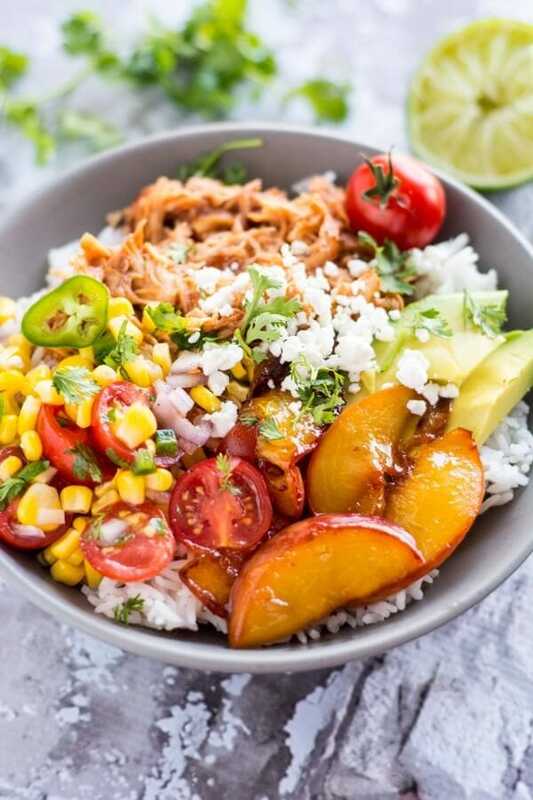 Dive into this recipe and into the most delicious “bowl” you have ever eaten! Make sure to flip peaches once to cook evenly on each side until nicely browned and softened but watch them closely so that they don't burn or get mushy. They should take about 6-7 minutes total. Made this yesterday, and it was delicious! Peaches are out of season, so I used frozen. Worked in a pinch, but is like to try it with fresh! So glad you liked it Sally!! The first of the seasons peaches just arrived here in Australia so I definitely am looking for ways to cook them up and eat them. 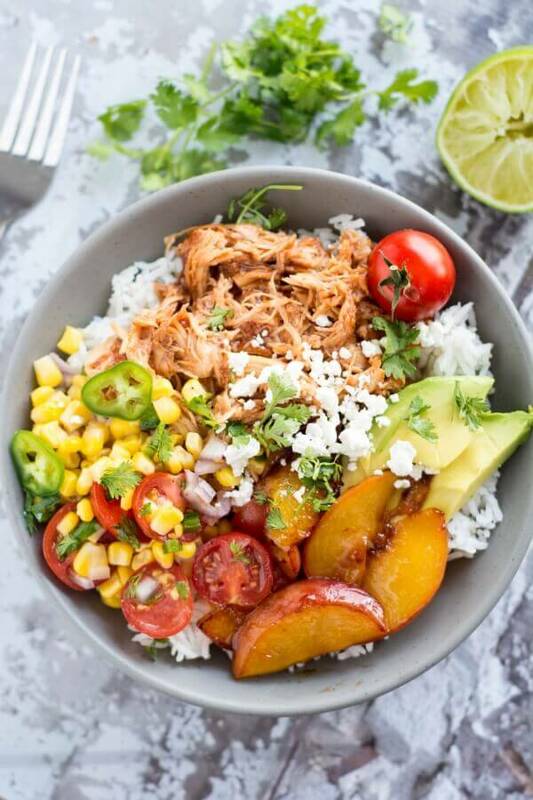 I have to make this recipe – these little bowls look delicious. 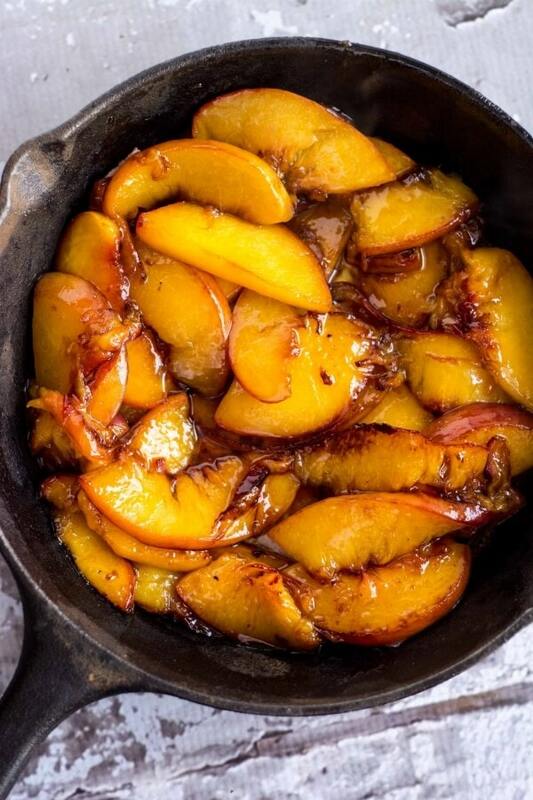 I never really knew I loved peaches but they are sure are delicious caramelized!! Enjoy!